An extensive set of measurements recorded daily swings in the chemistry of seawater in tide pools. A new study, based on the most extensive set of measurements ever made in tide pools, suggests that ocean acidification will increasingly put many marine organisms at risk by exacerbating normal changes in ocean chemistry that occur overnight. Conducted along California's rocky coastline, the study shows that the most vulnerable organisms are likely to be those with calcium carbonate shells or skeletons. Ocean acidification is occurring as the oceans absorb increasing amounts of carbon dioxide from the atmosphere, where carbon dioxide concentrations are steadily rising due to emissions from the burning of fossil fuels. Absorption of carbon dioxide changes seawater chemistry, pushing it toward the lower, acidic end of the pH scale, although it remains slightly alkaline. A small decrease in pH affects the chemical equilibrium of ocean water, reducing the availability of carbonate ions needed by a wide range of organisms to build and maintain structures of calcium carbonate, such as the shells of mussels and oysters. Kristy Kroeker, assistant professor of ecology and evolutionary biology at UC Santa Cruz, is a coauthor of the new study, published March 18 in Scientific Reports. "There is a lot of concern about how ocean acidification is going to affect marine species in the future, but most of our understanding comes from laboratory studies where a single organism is exposed to acidified seawater under very controlled conditions for a short period of time," Kroeker explained. "In reality, every organism is embedded in a complex community that experiences dynamic environmental conditions that will gradually change over time." In the new study, researchers closely monitored conditions in tide pools along California's rocky coast, which are isolated from the open ocean during low tides. During the daytime, photosynthesis—the mechanism by which plants use the sun's energy to convert carbon dioxide and water into sugar, giving off oxygen in the process—takes up carbon dioxide from the seawater and acts to reverse ocean acidification's effects. At night, however, photosynthesis stops, while the respiration of plants and animals takes up oxygen and releases carbon dioxide. This adds carbon dioxide to the seawater and exacerbates the effects of ocean acidification, increasing the risk to calcifying organisms. "Tide pools are home to lots of different species that regularly experience daily swings in chemistry," Kroeker said. "Tide pools can experience particularly corrosive seawater during nighttime low tides, when all of the animals are 'exhaling' carbon dioxide into the water that has been cut off from the ocean." 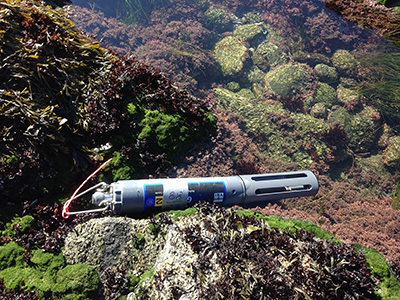 The research team, led by scientists at the Carnegie Institution of Science, used these natural nighttime spikes in corrosive conditions to examine how entire communities of marine species respond to natural acidification. 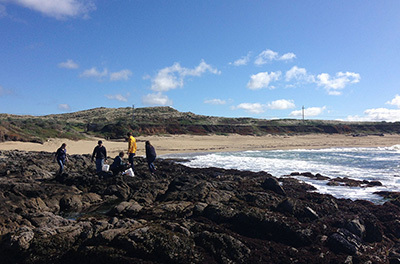 Observing a variety of California's natural rocky tide pools near the Bodega Marine Laboratory, they found that the rate of shell and skeletal growth was not greatly affected by seawater chemistry in the daytime. However, during low tide at night, water in the tide pools became corrosive to calcium carbonate shells and skeletons. The study found evidence that the rate at which these shells and skeletons dissolved during these nighttime periods was greatly affected by seawater chemistry. "Unless carbon dioxide emissions are rapidly curtailed, we expect ocean acidification to continue to lower the pH of seawater," said lead author Lester Kwiatkowski of the Carnegie Institution of Science. "This work highlights that even in today's temperate coastal oceans, calcifying species, such as mussels and coralline algae, can dissolve during the night due to the more acidic conditions caused by community respiration." These results highlight the vulnerability of marine species in even the most dynamic conditions to the global process of ocean acidification, Kroeker said. According to coauther Ken Caldeira of the Carnegie Institution, "If what we see happening along California's coast today is indicative of what will continue in the coming decades, by the year 2050 there will likely be twice as much nighttime dissolution as there is today. Nobody really knows how our coastal ecosystems will respond to these corrosive waters, but it certainly won't be well." The study was a collaborative effort by the Carnegie Institution for Science, UC Davis, and UC Santa Cruz. This work was funded by the Carnegie Institution for Science, UC Multi-campus Research Initiatives and Programs, and the National Science Foundation.